What is specific in vulnerability search on web sites powered by WordPress? Every web site, using popular content management systems, such as WordPress, has basically the same source code (scripts). This code has already been tested many times. Therefore, using general-purpose scanners for searching, for example, SQL injection, XSS and other popular vulnerabilities in WordPress, is unlikely to give results, as it has already been done many times before us. Nevertheless, security researchers regularly find vulnerabilities in both the main WordPress code, and in its numerous plug-ins, the themes of the design. This means that you do not need to scan WordPress by general-purpose vulnerability scanner, instead you should use a specialized program. 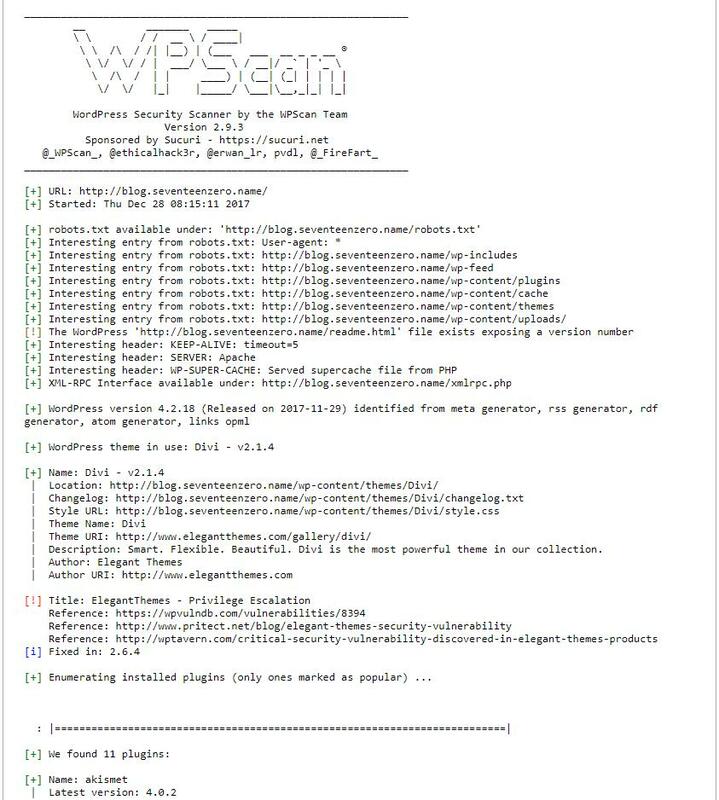 The best program for scanning WordPress is WPScan. 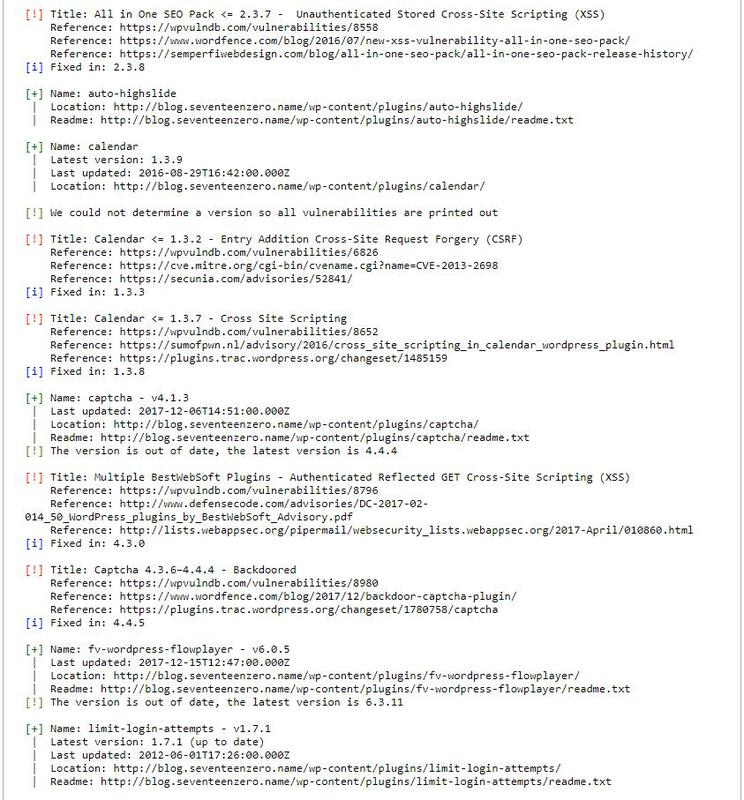 This tool is able to determine the version of WordPress, as well as what plug-ins and themes are used, which versions. 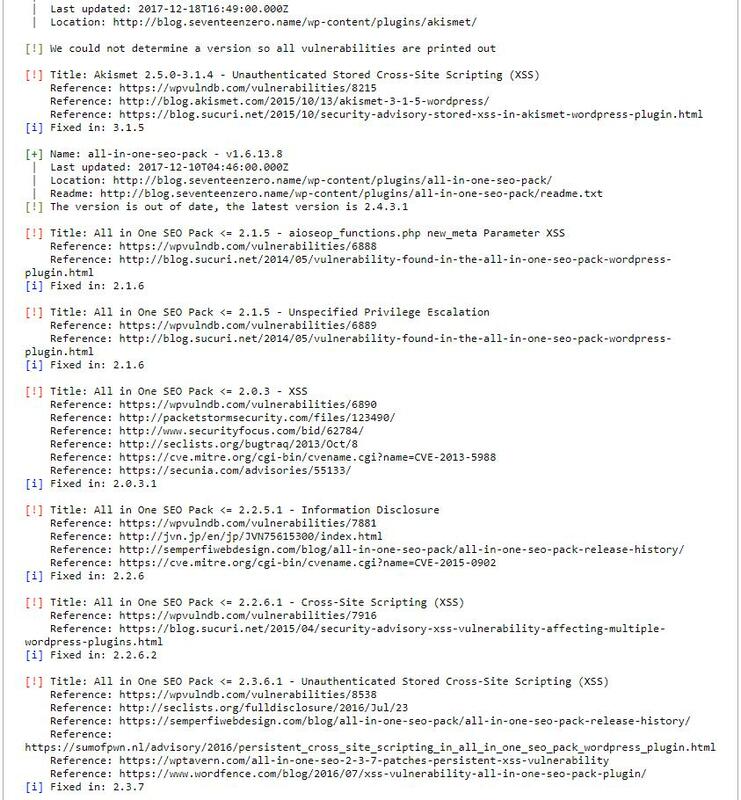 WPScan has an extensive and up-to-date vulnerability database of these plug-ins and themes. So by comparing the data obtained by scanning with this database, the program tells us about the vulnerabilities that are present on the site under investigation. 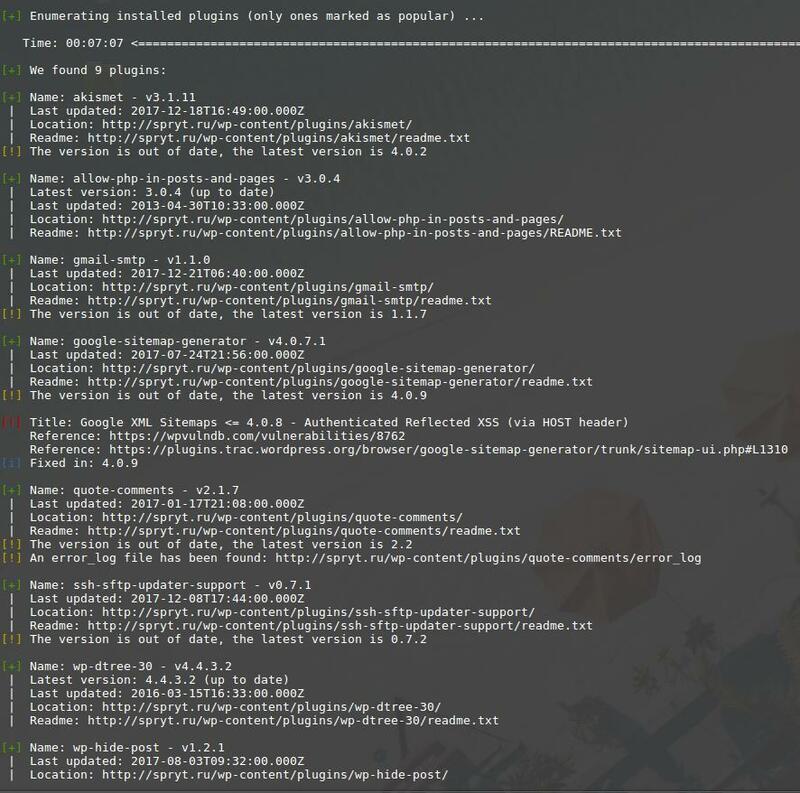 Note: if WPScan was preinstalled in you Linux distro (Kali Linux, BlackArch), you should start your command with wpscan. But if you installed WPScan manually, you should start your command with ./wpscan.rb instead. To set the target address, use the -u option, after which you need to specify the site to scan. In addition, if you know the names of users, this information can be used for phishing attacks or for brute force (brute-force passwords). 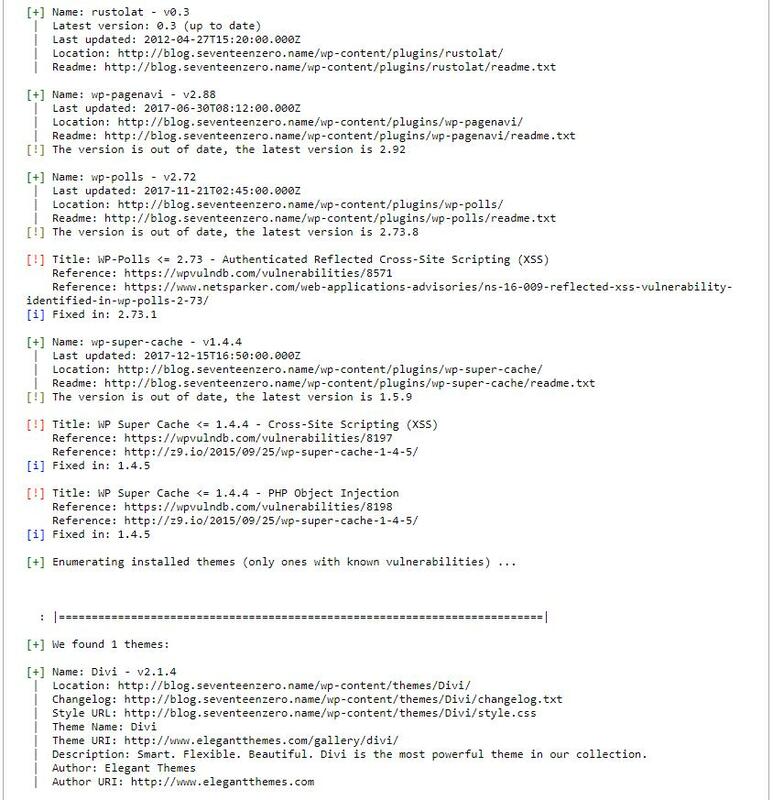 The report begins with a list of interesting records from the robots.txt file, interesting headers (can contain data about the server software) and the version of WordPress. 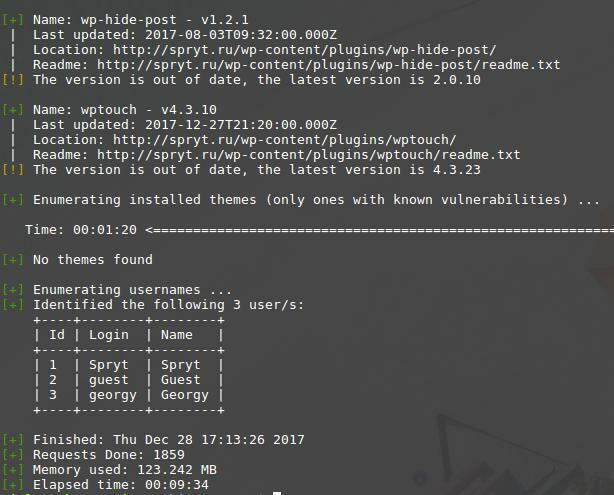 If the version of WordPress is vulnerable, it lists all known vulnerabilities, they indicate the version numbers in which WordPress is susceptible to attack, and versions where the vulnerability is fixed. Also links to additional information are given. If the plugin known as vulnerable, then information about this vulnerability is displayed. If the version of the plug-in could not be determined, then information about all the vulnerable versions is displayed. Also links to additional information are given. If you find a vulnerable plug-in or theme on your site, then update them as quickly as possible. If there are no updates for them, the best solution is to remove them as soon as possible. 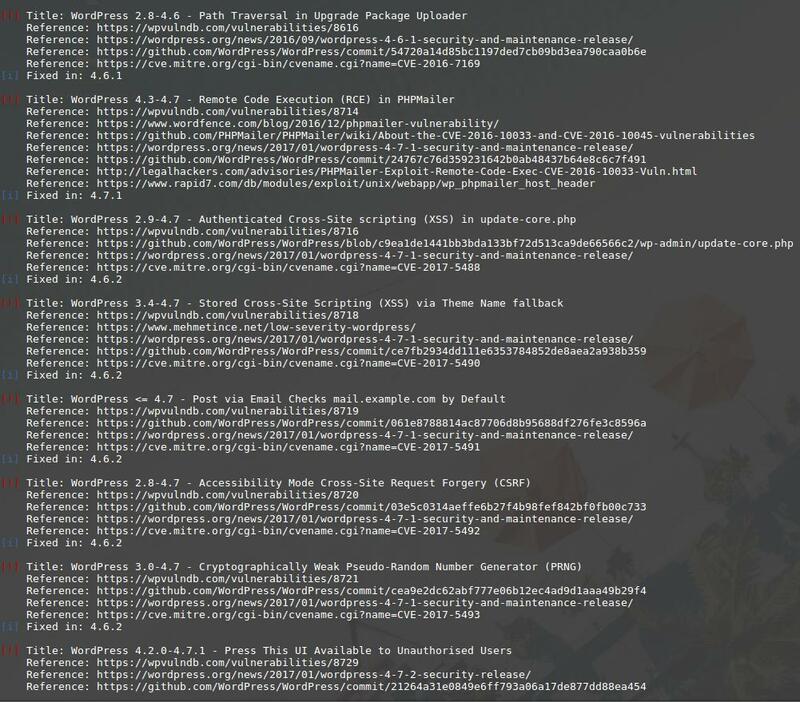 WPScan does not work on Windows. 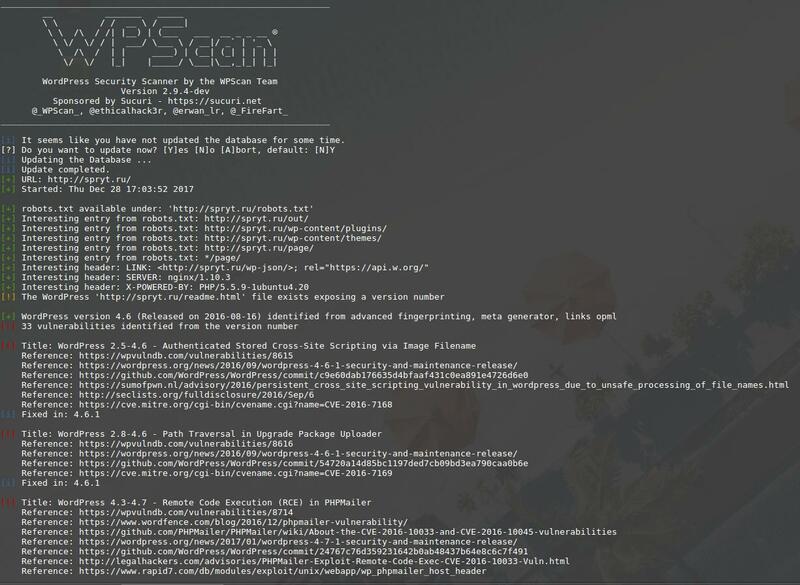 Therefore, if you want to scan your site but can not cope with Linux, then you can use the following free online service for scanning WordPress with WPScan:. There you just enter the address of your site and wait for the scan to finish (10-20 minutes).